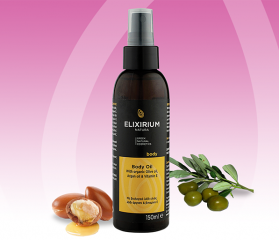 ELIXIRIUM NATURA - BODY OIL. 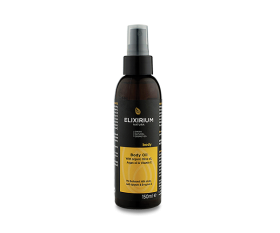 HomeElixirium NaturaBODYELIXIRIUM NATURA - BODY OIL. With organic olive oil, argan oil & vitamin E.
PARABENS, PROPYLENE GLYCOL, PARAFFIN OIL FREE. Rich body oil with organic olive oil, argan oil, grapeseed oil and vitamin E nourishes, deeply moisturizes and softens the skin giving a velvety feel without leaving oily residues. Suitable for massage. Ingredients: Glycereth-26, Caprylic/Capric Triglyceride, Isopropyl Myristate, Prunus Amygdalus Dulcis (Sweet Almond) Oil, Olea Europaea (Olive) Fruit Oil, Argania Spinosa (Argan) Kernel Oil, Vitis Vinifera (Grape) Seed Oil, Tocopheryl Acetate, Tocopherol, Parfum, Helianthus Annuus Seed Oil, Hexyl cinnamal, Limonene, Geraniol, Linalool, Citronellol.